The September/October 2012 issue of Horizons is now available. 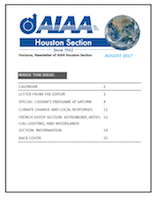 This free 52-page newsletter is available in both high and low resolutions, about 48 MB and 14 MB, respectively. This issue includes: cover story: The 100 Year Starship September 2012 Public Symposium in Houston. Man Will Conquer Space Soon! 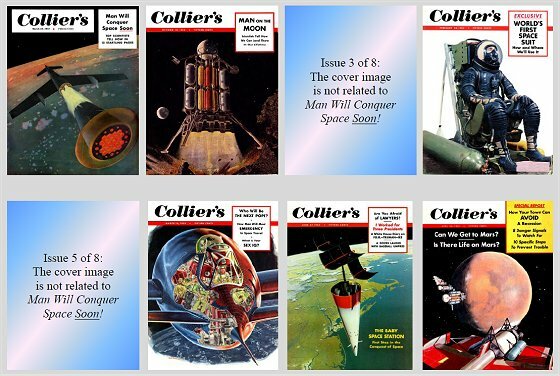 We are reprinting this Collier’s space series from 1952 to 1954, and this issue has the articles from October 18, 1952, the 2nd of 8 installments. Paradises Lost, the opera from the Le Guin generation starship novella. Lunar Surface EVA Route Selection Optimization by Yvonne Vigue-Rodi. Comet ISON (C/2012 S1) 2013 – 2014 by Daniel R. Adamo, Astrodynamics Consultant. From our French sister section 3AF MP, Third Annual Aerospace Festival of Art and Literature, Stars and Wings. The Fog of War Obscures a Great Aerial Dogfight (Speculation) by James C. McLane III. Convair “Super-NEXUS”, APR Corner, Aerospace Projects Review, by Scott Lowther. Current Events, Capsule-Helicopter Hybrid Spacecraft by Jeff Hagen.